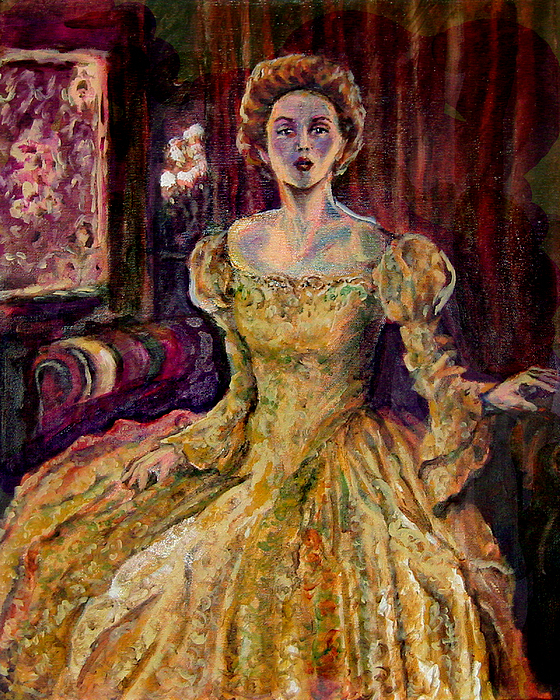 Victorian Elegance 1 is a painting by Laura Heggestad which was uploaded on January 16th, 2010. And now for something completely different.... I may have mentioned in my profile that I used to do portraits--overwhelmingly, compared to other subjects for painting. I've gone back to that a bit, here. In my hometown of Lexington, Missouri, there's a charming mania for all things Victorian. There's an extensive historic-housing district, and a dominant local profession is running antique shops. Remodelers and interior decorators probably have a pretty good client base out here, too. In the spirit of things I have painted the lady whom I have come to think of as "Ingrid". No reason why this really should be her name, any more than there's a reason for authors to hear the voices of characters in their heads, right? But she has grown on me as Ingrid. But she may materialize in your imagination with another name altogether, which would be quite fitting, as her art-spirit shouldn't be confined to the limits of solely one imagination! For her I combined a couple of techniques. Contradictory to my own working history in art, I built her face/shoulders up gradually, one slow layer at a time. It was a wonderful stretch of technique for me, having been able to dispense with such patient pursuits since my days in academia! I am an impatient (if altogether happy) artist. I get antsy, I need a quick 'fix' at the beginning. I don't mind spending ages with a painting (and I certainly did with her!) but I like to see within the first 2 hours that it's definitely, eventually, going to become what I hoped it would. I didn't get that assurance, that quickly, with Ingrid, here. But I stuck it out with her, and our connection went from tautly watchful to warmly appreciative. Then I cut loose with the final phases of her gown, and painted in a way much more natural for me! Maybe there will be a place for this challenging but lovely lady in your home. Hi, Laura this is a beautiful painting, the expression on her face, the backround with the brightness of her dress r a very well done combination,bravo, like also ur landscapes full of colors.Thanx for ur comments sometimes we need little things just to encourage us to give more. Thank you very much! I only started entering my artwork yesterday on this wonderful website. Your comment is one of the first I've received, and I appreciate the spirit of welcome! Very beautiful work, Laura. You have captured the essence of the Victorian era.